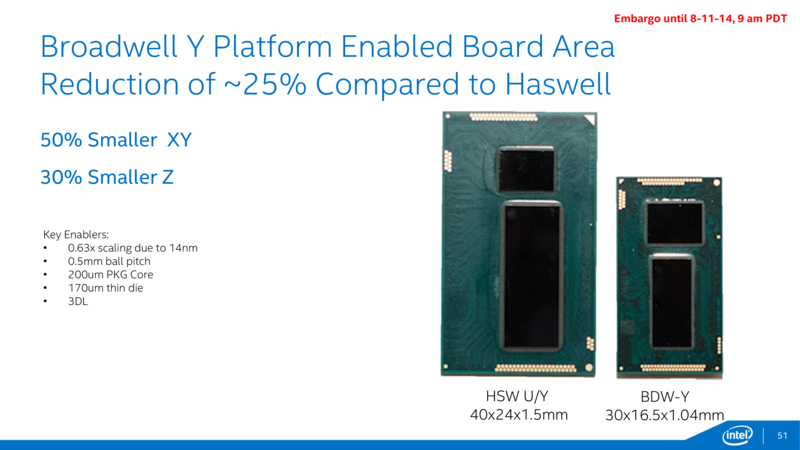 On Monday Intel gave the first official preview of its Broadwell platform, which the company believes is its first step in effectively competing against ARM in the mobile space. Broadwell has been the focus of numerous leaks in the press. Its the first chip to be manufactured on Intel’s industry-leading 14 nanometer process node, and will fill a variety of roles for Intel in everything from the mobile, notebooks to Internet of Things (IoT) devices. In the notebook and tablet market, Broadwell will have the name “Core M” for consumers and “Broadwell-Y” for comparison charts. Intel says Broadwell will improve TDP efficiency by two times, will have 50% smaller packaging, a 25% smaller board, and a reduced power draw of 60% when the SoC is idle. According to information disclosed by Intel, Broadwell’s CPU will have a higher Instructions Per Cycle (IPC) rate of 5%. In addition, Broadwell’s GPU will support Direct X 11.2, as well as OpenCL 2.0. For Intel, Broadwell represents a “tick” in the company’s tick-tock cycle, the last “tock” being Haswell (for an explanation of Intel’s tick-tock cycle see this) . 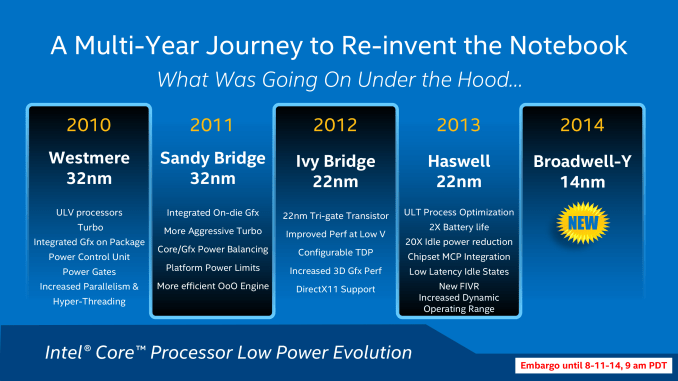 Effectively, Broadwell is Haswell on the 14nm process node — the die shrink results in a number of optimizations such as a reduced power draw that makes the chip more competitive than the “tock” of Haswell. With this “tick” comes minimal increases in CPU clock speed, but also a fair increase in GPU power. Intel says Broadwell’s GPU can push out 20 percent more compute power and 50 percent higher sampling than Haswell. But while some might be disappointed about the miniscule improvements in CPU clock speed an improved CPU clock speed is not the focus for Broadwell — instead it’s all about making x86 more competitive in the mobile space. 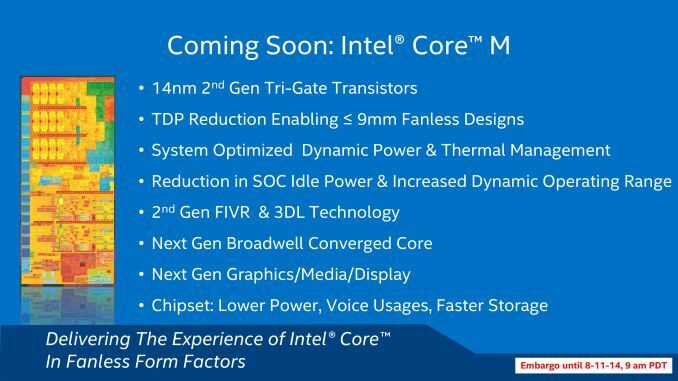 Broadwell has the makings of being Intel’s most efficent chip to-date. While Intel’s mobile ambitions have been rife with problems, a radically more efficient chip in power and thermals could be the boost it needs to be more competitive in the arena. More information on Broadwell is expected at IDF San Francisco next month. The IFA consumer electronics show in Berlin, occurring a week earlier, should feature the first Core M sporting products. The first devices sporting Broadwell will be available for the holiday season, with broader OEM availability in early 2015. Canadian journalist in Taipei. Formerly of China Economic Review (Shanghai), VR-Zone (Taipei) and Hardware Canucks. Freelanced here and there for publications like The Georgia Straight (Vancouver) and TechVibes (Vancouver).